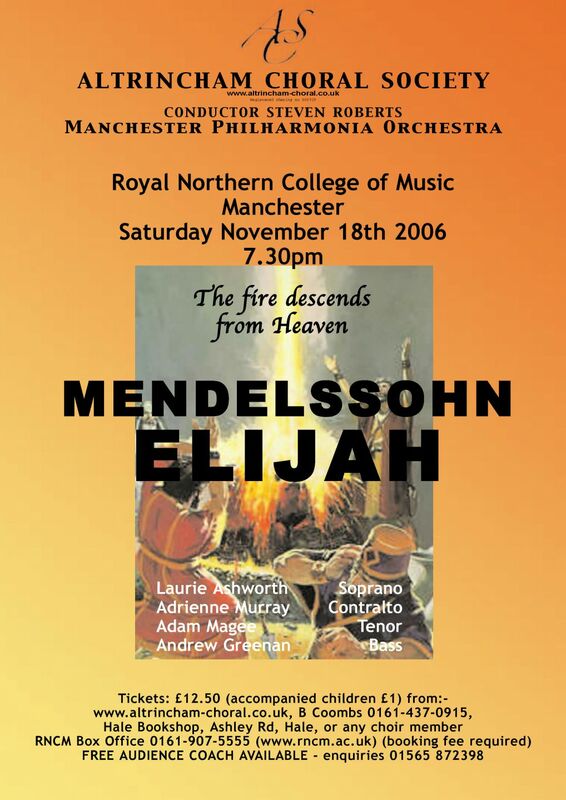 Having been a member of choirs in the Lake District for many years, I was very pleased to be invited by my aunt, Dudley’s sister, to the recent performance of ‘Elijah’ given by ACS at the RNCM, conducted by their Music Director, Steven Roberts. I was obviously not the only one looking forward to the evening’s performance, as there was an almost tangible air of eager anticipation as we boarded the courtesy bus in Hale. From the very first notes of Mendelssohn’s oratorio, sung most effectively by the bass soloist, I knew that the capacity audience was in for an exceptional evening. I waited for all my favourite parts of the work to come along – and wasn’t disappointed. The choir was most impressive in the contrapuntal sections, which demonstrate Mendelssohn’s admiration for the music of J.S. Bach and Handel. I could sympathise with one member of the choir who told me that he felt the choir was quite challenged by the powerful orchestral sound but, from the audience’s point of view, the ‘tutti’ passages with full organ were most thrilling. Furthermore, the choir proved that it had the stamina necessary to cope with the demands of the ‘forte’ choruses. How many amateur choirs nowadays have the luxury of 10 tenors? Could any of them be persuaded to move to the Lakes? The five soloists sang beautifully, from the wonderfully bell-like quality of Maxwell Wynn Davies’ treble voice, to the rich, sonorous tones of Andrew Greenan, whose moving portrayal of Elijah was central to the success of the drama unfolding before us. If ‘we heard it with our ears’ has become a catchphrase for many of us who have sung ‘Elijah’, ‘we saw it with our eyes’ would certainly not have been inappropriate on this occasion. One of the many highlights of his performance (sung form memory) was the aria ‘It is enough’ with the plaintive cello obligato, which was played beautifully. This was a most enjoyable evening, during which the ACS, soloists and orchestra, not to mention their tireless conductor, had given their all. I am looking forward to the next opportunity of hearing a choir which is obviously going form strength to strength. Piano teacher, organist and contralto singer in local Lake District choirs.